I’m so excited to show you this little ribbon mobile today! I wasn’t entirely sure how it was going to turn out, but I am absolutely loving the finished product. AND, big bonus, it was super easy to make. We are currently in the process of moving my daughter into a new bedroom. We have decided to put the new baby into the room that my daughter has occupied for the last 2 years, and move her into a larger “big girl” bedroom. Last weekend, we moved all her furniture over, and much to my relief, she is loving her new room. (Click here to see the full room reveal.) Phew! Initially, I purchased 9 spools of ribbon. I went with mostly neutral colors, with a couple of pops of pink, as that is the theme in her room. I also tried to choose a wide variety of textures and widths to give it plenty of depth. I actually picked up two macrame hoops (a 6″ and an 8″) because I wasn’t sure which size would be better. 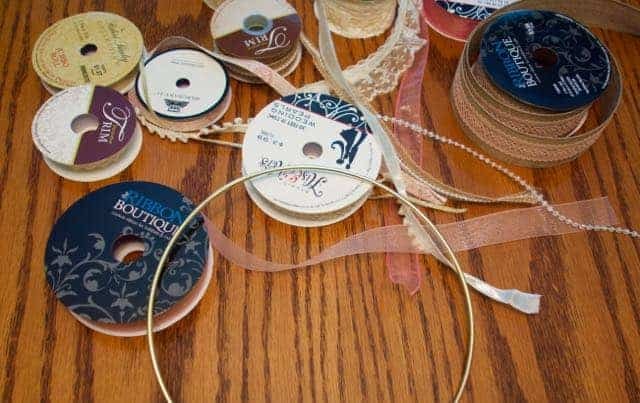 How many spools/yards you will need depends entirely on the size of your hoop and how long you cut your ribbon. I cut my ribbons quite long, because I figured I could always make it shorter if I wanted to. As you can see though, I ended up leaving it long. I cut a number of strands of various ribbon to begin with. I didn’t measure them at all. I just eyeballed them against one another. I seriously just had to look that up. Apparently, the particular knot that I used is called a Lark’s Head, or Cow’s Hitch, knot. Don’t worry about the name though. They are very easy to create. 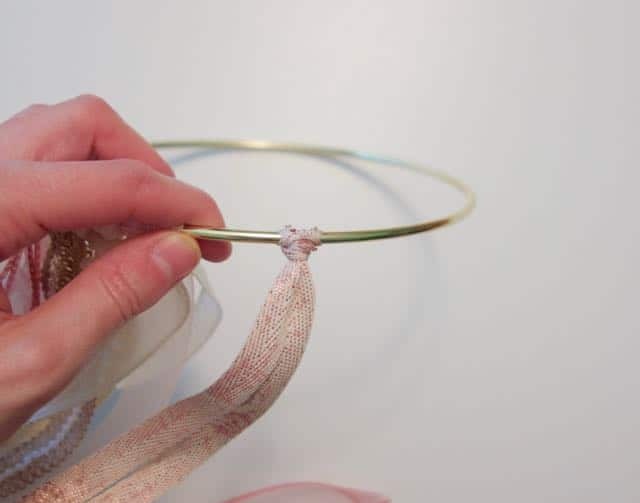 Then, take the two tails of ribbon, pull them around the hoop and through the center of the loop. Finally, pull on the two tail ends to cinch the knot tight. 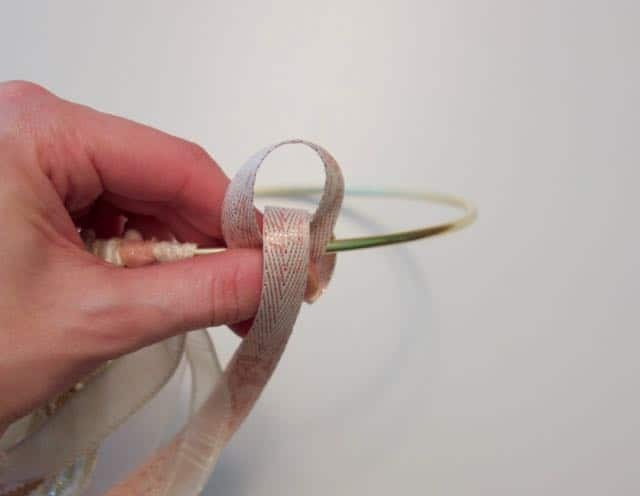 Just continue knotting ribbon in this way onto the hoop until it is full. I didn’t go in any specific pattern. I simply tried to space out the different ribbons throughout the hoop. I cut three pieces of twine. (You will want these to be the same length.) 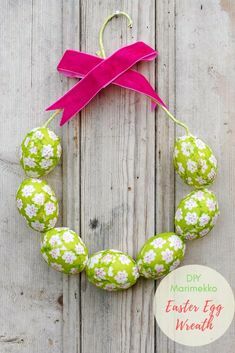 Tie each one onto the hoop in a triangle pattern, and then knot them all together at the top. I love how feminine and whimsical it is. I chose to leave the ends uneven because I kind of like it that way. You could easily even the ends out though with some scissors and a few extra minutes. And now I can’t wait to get started on my next project for her room! I’m already collecting the supplies. This is really beautiful. 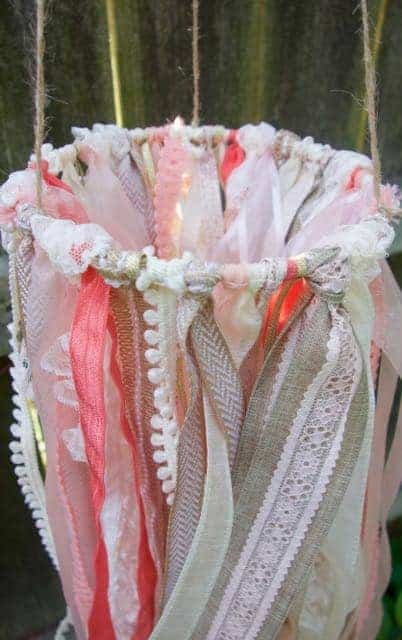 I just wanted to share that I made one very similar in a class but it was hung flat not in a mobile so sort of like a dream-catcher way, does that make sense? 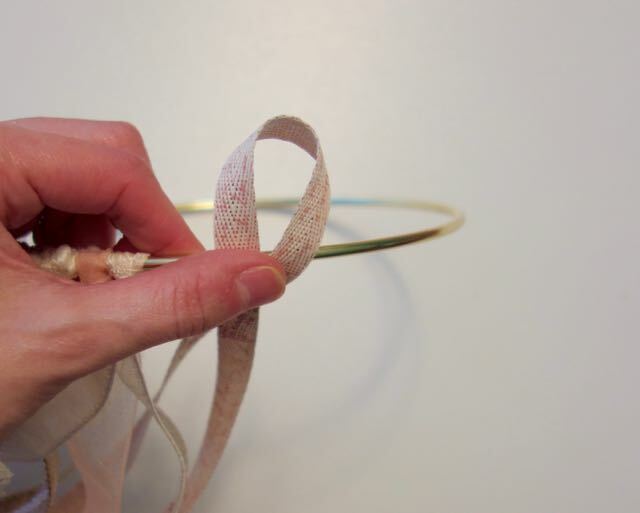 This way you can use less than half the ribbon. 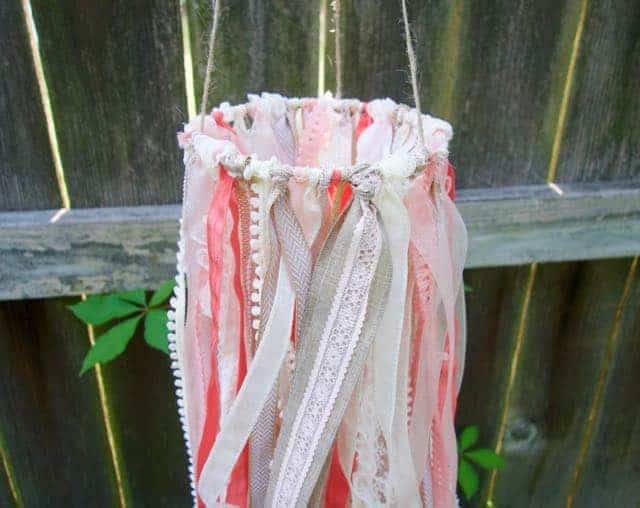 Maybe you can alter the one you made when your daughter is out of the crib and still keep as a wall décor? That’s a great idea! I may just do that at some point. The room that we moved her into already had a hook in the ceiling right above where her bed went. So, the mobile was just perfect for it. I’ll definitely keep that in mind, though! Thanks for looking! This is lovely. Your daughter is so lucky to have a new room and a mom who will help make it pretty! 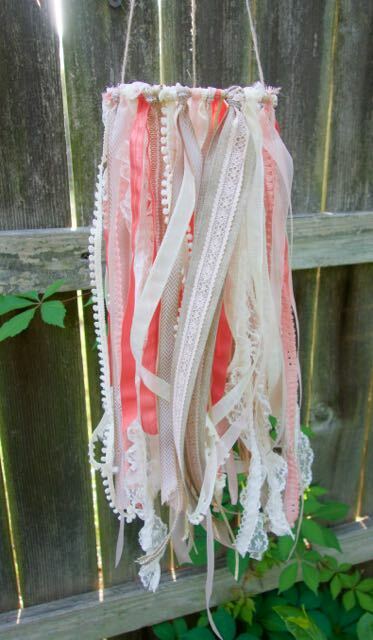 Great job, I love all the varieties of girly ribbons. Thanks for sharing at My Busy Beehives #beeparty this week! Thank you! I hope you both enjoy making your own! Cool idea, Amy. My girls are all older (19, 16 and 12), but they would have liked something like this in their rooms. Of course, they might have asked for them in their favorite team’s colors! Glad to have found you through the Happy Now Blog Linkup. Thanks so much! Fortunately, we’re still at a place where I can call the shots in her room. 😉 I know that won’t last forever, though, so I’m enjoying it while I can. Thanks for taking a look! That is beautiful and so simple! I bet it would look pretty in a garden too. Pinned. Thank you! And it did look great outside. I’m just not sure how well it would hold up. You would have to take the weather into consideration when buying supplies. Thanks so much for the share!! This is beautiful! 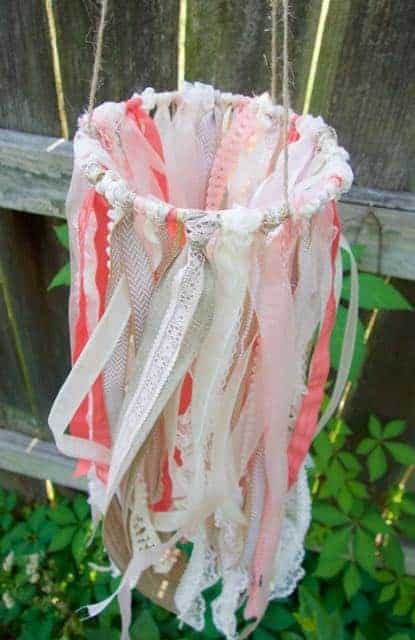 I’m totally going to make this if I have another little girl! Thank you! It was so easy! Hopefully, you’ll get a chance to make one! Yay! I hope they enjoy it, and you all have fun making one. 🙂 Thanks so much! 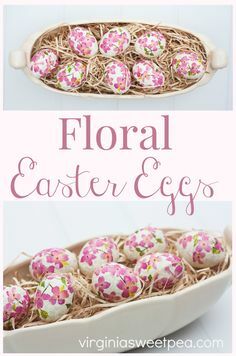 This is so simple and cute! 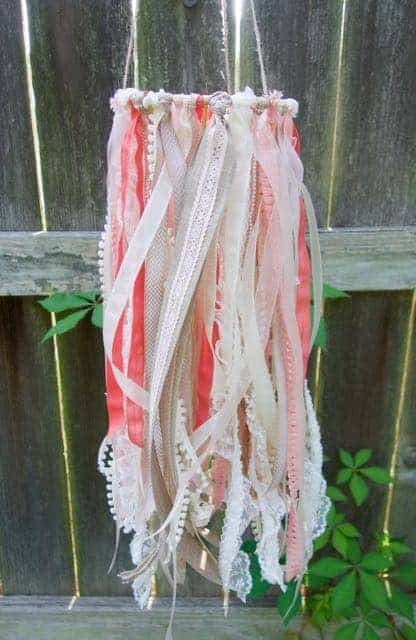 I want to make something like this in red-white-blue ribbons to hang on our porch for July 4. Thanks for the tutorial. That’s a great idea! I hadn’t thought about it that way before, but you could make one of these for all sorts of holidays. Thanks so much! I hope you enjoy! This is really pretty!! Sorry I’m so late to stop by – been on vacation all week! Thanks for sharing on the Pleasures of the NW’s DIY link up! Thanks so much! I hope you had fun! Just adorable! Pinned. Thanks for sharing at To Grandmas House We Go. Thank you! And thanks so much for the share! Featuring this tonight too. Have a great week. Thank you! I love the colors, too, but it’s been hard to match them throughout her bedroom… Hopefully, it will all pull together soon. 🙂 Thanks for looking! Amy I love the simplicity of this project. The effect is fun and whimsical. You lovely mobile is my feature this week at Sweet Inspiration. Congratulations! Ha! I would kind of like one myself, as well. 🙂 Thanks so much for taking a look!